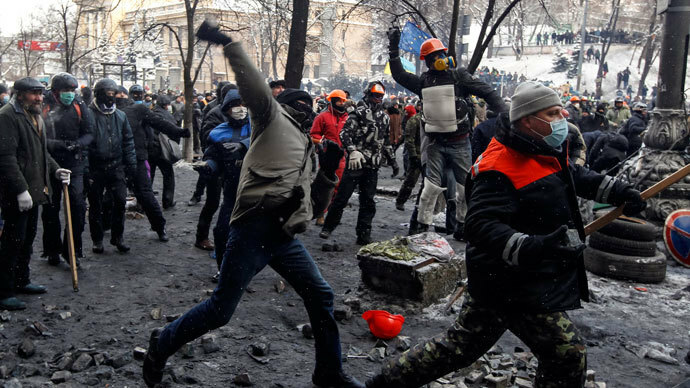 Disturbing footage from Ukraine shows violence spiraling out of control during anti-government protests, with rioters attacking and capturing policemen standing their ground. The Interior Ministry has hinted at a tough response if the unrest continues. Western media exploded with outrage at the abuse of a Ukrainian rioter who was stripped naked and mocked by the police for “particularly accurate” petrol bomb throwing. 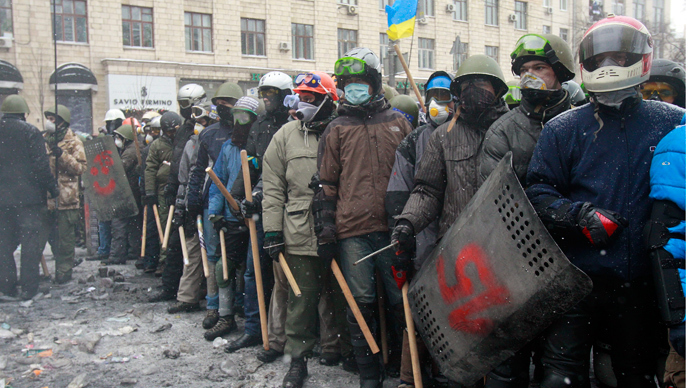 However, few outlets have highlighted the violence coming from those on the other side of the barricades. 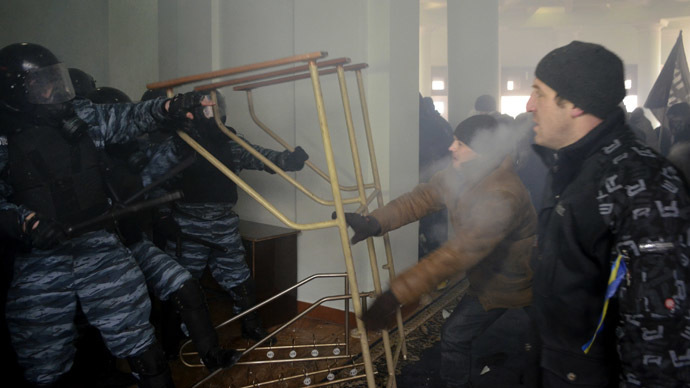 On Saturday, protesters in the city of Vinnitsa occupied the city council building, breaking a feeble cordon of interior troops. A triumphant mob cheered and poured into the building as the doors flung open, only to find that more police were blocking the stairs to the upper floors. Armed with improvised clubs from pieces of broken furniture, dozens of aggressive rioters pounced at the police in an attempt to ram their way through. They tore off officers’ protective helmets and shields. The police stood their ground, having apparently not received an order to retaliate. Some of the officers that the rioters encountered on the ground floor served as a punching bag for aggressive youngsters, who kicked policemen and poured powder from fire extinguishers on their faces at point blank range. Rioters also pulled out a fire hose and aimed it at police. Several policemen were dragged away. Footage shows that some officers retreated to the upper floor. A police stun grenade could be seen exploding amid the crowd, though it did not set any of the rioters back. Meanwhile in Kiev, protesters occupying Independence Square (Maidan Nezalezhnosti) and the mayor’s office released two policemen that had been held captive since Friday night. 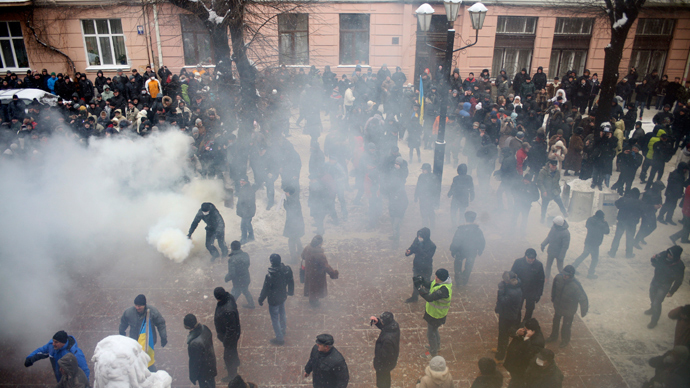 According to the Ukrainian Interior Ministry, three policemen were attacked by so-called “Maidan guards” on Friday. One of them was stabbed with a knife. The other two were held hostage in the occupied administrative building. The opposition has denied the ministry’s report that police officers were attacked by protesters. The captured law enforcement officers “were tortured and are now hospitalized,” Interior Ministry head Vitaly Zakharchenko said in a statement. Zakharchenko thanked peaceful protesters and ambassadors of some foreign states who have helped with the release of policemen. However, he then went on to threaten the same protesters with the use of force. 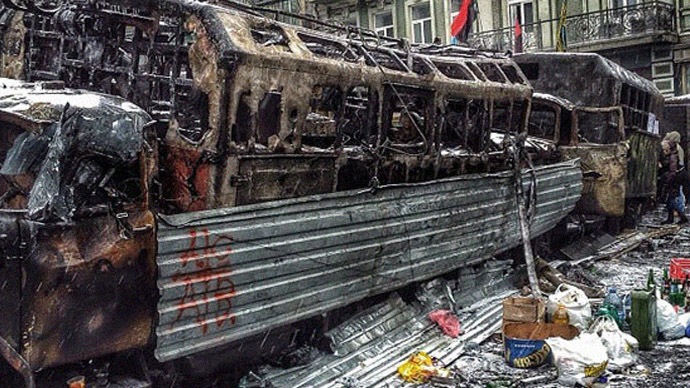 “Those who remain on Maidan and in the occupied buildings will be considered extremist groups. In the event of danger, if the radicals spring into action, we will have to use force,” Zakharchenko said, as quoted by ITAR-TASS. “This is not a game of war. Here we have real victims – the policemen burning alive, the extremists shooting off the people. They are hiding behind the backs of women and children, they crave for chaos. But one does not build a strong state on blood,” Zakharchenko said in his emotional statement. 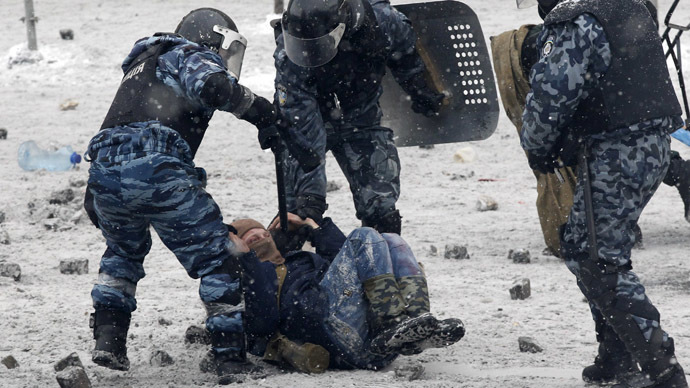 Opposition protesters, however, have been painting a different picture of the recent violence, claiming the Berkut special police force is responsible for shooting at rioters and wounding several people. Initial claims of “snipers killing people” in central Kiev proved to be unfounded after rounds pulled out of some of the wounded turned out to be suitable only for sporting guns. A man who took part in earlier clashes with police and was injured by such rounds died in hospital on Saturday. Conflicting reports then put the number of those killed in the riots between five and ten people. Protesters online claimed the rounds could have been loaded in special police force shotguns. Ukraine’s prosecutor general has strongly denied that police could have used any lethal rounds in the clashes, stressing that both the orders given to the officers and the ballistic evidence rule out such a possibility. According to the prosecution, it is some “unidentified individuals who purposefully aim at destabilizing the situation in the society” that are responsible for the deaths amid the clashes in Kiev. Similar ammunition was reportedly used in the killing of a police officer who was shot dead on Friday night in a separate incident. 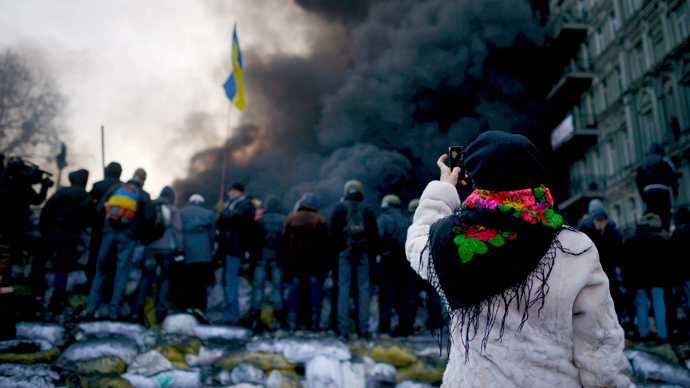 Activists or antagonists: Are Kiev rioters seeking solutions or scuffles?